Leopard geckos (Eublepharis macularius) are reptiles endemic to Pakistan, northwestern India and parts of Iran, Afghanistan and Iraq. The scientific name that was given to leopard geckos is derived from both Greek and Latin. Eublepharis is a combination of Eu, which is Greek for “good,” and blepharos, which means “eyelid.” Leopard geckos are unique among other gecko species; in part, because they have eyelids. As their common name suggests, they are called leopard geckos because of the spots they have on their backs, heads, legs and tails, which are reminiscent of a leopard’s spots. Leopard geckos were first described in 1854 by British zoologist Edward Blyth, who spent many years living and working in India. In the wild, leopard geckos are ground-dwellers and live in semi-desert rocky areas. Because of their natural habitat, leopard gecko feet are very different from the feet many other species of geckos who are known for having plate-like toes, which enable them to climb and stick to smooth surfaces. Since leopard geckos stay on the ground and are not climbers, they don’t have the characteristic feet that people normally associate with geckos. Leopard gecko feet are small and they have claws. Leopard geckos have something that most other geckos don’t have – they have moveable eyelids! This means they can blink and sleep with their eyes closed. Leopard geckos also have exceptional eyesight. It’s believed that they can see colours in the dark. Their eyesight is said to be as good as a cat’s. Leopard geckos are small lizards, but are large compared to other geckos. When fully grown, they can reach a length of 8 – 10 inches (20 – 25 cms) tip to tail. Don’t judge a book by its cover! Leopard geckos feel soft to the touch even though they are covered with bumpy skin which gives them a rough appearance. Leopard geckos typically have yellow skin dotted with dark spots, with a white underbelly. But captive breeding has created leopard geckos with different colour and pattern variations. Leopard geckos have slim bodies, but they have short, fat tails. They actually store fat, water and nutrients in their tails, which helps them survive during times of famine. Leopard geckos will drop their tails in order to defend themselves when they feel threatened by their predators, which include foxes, larger reptiles, snakes and birds of prey. A study by University of Calgary zoology professor Anthony Russell found that the leopard gecko tail will perform acrobatic moves like flips and jumps to confuse and distract their predators. The study finds there is a movement “control center” of sorts at the end of the tail, which is activated once the tail is separated from the leopard gecko’s body. The findings could have implications for research into human spinal cord injuries. Leopard geckos can regrow their tails within a couple of months. But their regenerated tails will not look exactly the same as the ones they were born with. Did you know that a leopard gecko made medical history? 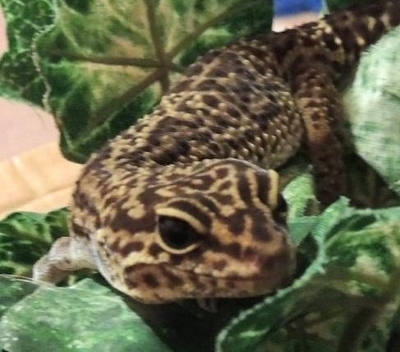 A 13-year-old leopard gecko in California named GirlieGrrl is believed to be the first ever in the world to be treated for hyperthyroidism in 2010. Leopard geckos have an average lifespan of about 20 years in captivity. But there are reports of some leopard geckos who have lived to almost 30 years.